- Know where to go. Your state's Board of Elections will tell you where you should go to vote. (This is the polling location website for the state of NY.) Also, sites like Rock the Vote are committed to making sure first-time voters know what they need to know, including everything from where your polling place is to what you have to bring with you. Another good reference is Vote411. - Make sure you weren't "purged." Sites like Can I Vote? can tell you whether you exist according to registration records. Make sure you check, since many registrations were purged recently. You don't want to not find out till you show up tomorrow! - Preview the ballot. Enter your address information into Smart Voter to see what will be on the ballot you see tomorrow. This gives you a chance to review any Propositions you may be voting on ahead of time so you don't hold up the lines tomorrow. Also, in case you don't know much about your local candidates, this gives you a chance to research them in advance so you can make an informed decision tomorrow. - Know the rules. Different states have different rules about whether you need an ID to vote, whether you can wear campaign gear (i.e. an Obama t-shirt, etc.) at the polling site, etc. You don't want to take the chance of being rejected from voting once you've stood in line tomorrow! 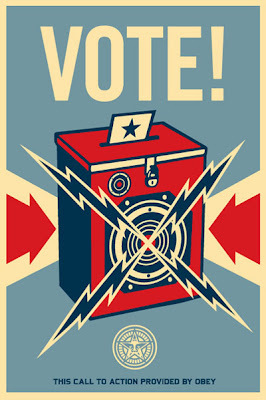 Along with sites like Rock the Vote, also check out articles like ABC News' "Voting 101", CNN's "Voting Guide" and Time Magazine's "7 Things That Could Go Wrong on Election Day" to get more information. Whoever you're voting for, just make sure you vote tomorrow! Because remember - if you don't vote, you can't complain.